Last Thursday, I finished my final revisions, based on the suggestions of my editor, and then I immediately emailed that sucker to the copyeditor for, basically, a high-level proofread. Which means . . . happy dance–I’m done! Sure, I still have to write the acknowledgments and whatnot. I’ll do that while I’m waiting for my copyeditor to get the edited manuscript back to me on Friday. Next I send the final copy with all the extras to the formatter to convert it to a Kindle ebook as well as a print version for Amazon. By the end of the month, I should see the proofs of my cover from the designer, and then I’ll upload all of that to Amazon. But the story is finished, and I am really happy with how it turned out. It’s gone through a lot from first draft to final, and I like where it ended up. I hope you will, too! Just heard back form my cover designer. I put down my deposit, and she plans on having the proofs of the cover to me by the end of September and the final revisions done no later than October 15. My designer is Regina Wamba of Mae I Design. She has designed covers for New York Times and USA Today bestselling author Jessica Sorensen. Her covers are just plain gorgeous, especially the supernatural stuff like my novel. Check out her work on the Mae I Design facebook page. Hearing back from her, that the dates will work, I’m ready to announce that I am planning a book signing, with free custom-designed bookmarks, Halloween candy, and maybe a short reading on Saturday, October 26th in Nebraska. Stay tuned for the venue and more info on my final revision. After sitting on pins and needles for the last couple weeks, I’ve finally heard back from my editor. She emailed me the line-edited manuscript with the editorial letter and the copy for the query letter and the book description for Amazon to come tomorrow. In other news, I’m in the process of contracting an awesome designer to create the cover for my novel 🙂 More on that in the next week, and I’m getting really excited to share my novel soon! It’s been awhile since I last blogged, but for very good reason. I was working literally day and night to finish editing my first draft. I’d tentatively contracted my editor to begin on July 24 with the option to push it back into August if needed, but I really wanted to get my manuscript to her my that deadline. Realizing I was about halfway through and it wasn’t going to happen at my current pace, I had two different friends help with babysitting for a total of eight days before the deadline. By the end of it the kids had definitely reached their babysitting limit, and I was close to done, but now quite there. The next night after the last day of babysitting, after they went to bed, I stayed up until 6:30 AM, but didn’t quite finish. I contacted my editor and told her I’d need a few extra days past the 24th and she was totally cool with it, but I was so close and still itching to finish, so I kept pushing hard to get to the end. The last 60 pages were like walking to a hotel on the other end of the Vegas Strip. You can see it, and it looks like it’s right there, but you keep walking and walking and walking . . . I stayed up the next night until 3 AM, the next until 5 AM, the next until 5AM, drinking obscene amounts of caffeine. Finally, I caved and slept two nights. Then I finished, staying up until 7 AM the last night. The sun was coming up. It was crazy, but it was great to have a complete second draft to email to my editor. Since I got the manuscript to her about a week past the original deadline, she’s estimating she’ll have the edited version back to me about a week later than she’d originally anticipated, which will be August 14. I can’t wait for the feedback! I want to take her comments and suggestions and make this the best novel possible. I already feel so much better about the second draft than the first. I halved the word count, upped the zombie count, and now I feel like the pacing is so much better. I chopped all of the unnecessary back story, added a couple of scenes, and conpletely rewrote several chapters. All in all I’m really happy with the progress, and I can’t wait to share my novel soon. If I self-publish I’d like to get it out by October. I feel like I’ll have a better idea if that’s possible once I see what kind of changes the editor suggests. When I started writing, I planned on a trilogy. There was just way too much story for one novel, and trilogies are kind of the thing, so I figured, hey, why not? As a reader, though, I realize that I often hate the middle books of trilogies. There are some great exceptions, but in my case, I don’t feel like I have three complete stories to tell, so I’ve decided that my novel will only have a sequel. I’ve also decided to change the name of the first book from My Undying Love to Undying, which will also be the name of the series. When I came up with My Undying Love I thought it was a great double entendre, but now I’m thinking it just sounds too much like a romance novel. I’ve also come up with a potential title for the sequel, so the first book will be Undying and the second will be Reliving. Finally, although I’ve scrapped the idea of a trilogy, I do plan on writing a companion novel to the series, set in the same world, but featuring one of the side characters. I also plan on writing two additional novellas or short stories told from the points of view of two other characters in the story. For next week, another progress update. I’m happily moving right along in my editing. An In-Depth Look at My Writing and Revising Process With Pictures! Before I explain how I edit, let me explain how I write. First I had an outline in my head of all the main events of the story. As I wrote, I made up the details in between, but I always knew where things were headed and where they’d end up, which prevented me from ever getting stuck. Each day when I started working, first I’d go back and edit what I’d done the day before and then I’d keep writing from there. It helped refresh me on where I was in the story, got me back into the flow of things, and also made what I’d written before manageable, so it wouldn’t be a total, undecipherable mess when I came back to it after finishing the first draft. 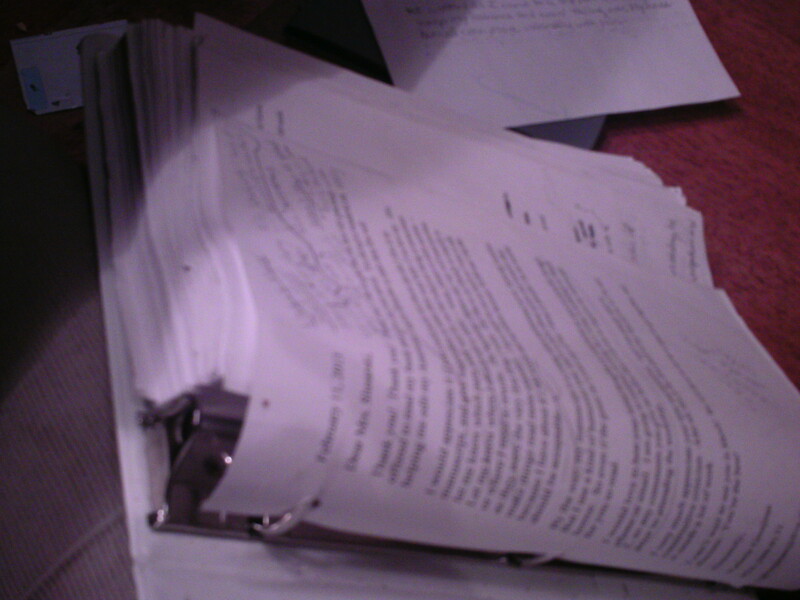 Revising, I use pencil on a printed copy of the manuscript, going through and making changes a chapter at a time. Then I go back and enter the changes on a new document in the computer. Reading through the edited chapter on the computer, I make my final changes, and then the process repeats. As I mentioned in my last blog, I’m cutting about fifty percent of what I’ve written so far, which is fine, because I started with about 300 total pages. Also, I plan on adding a couple of scenes when I’m through, making the length right where I want it to be. Thankfully, no one else will have to slog through all 300 pages. It’s getting shorter, better, and more to the point each time I work on it. Work has been going well. I’ve been picking up the pace, and next week I’ll let you in on my new plans for the novel, including the new title I’m contemplating and plans for the series! I’ve been waiting to give an update on my revision process until I finished Chapter 6. Unfortunately, Chapter 6 took awhile. It needed heavy cuts as well as a complete rewrite of the end of the chapter to make it work. Now I’ve finally gotten through that pesky chapter and I’ve reached a few milestones in the editing of my first draft. I’ve gotten through the first of four Parts in my novel, I’ve finished the first 20% of my book, and my word count is now under 80,000 words at 79,142. That means that I’ve cut 9,229 words out of the first 18,289 words, a little more than half. My manuscript as a whole is now 273 pages instead of 295. If I keep this up this rate of cuts my manuscript will be halved in the end from 88,370 words to 44,185, which would be a little short but okay. I don’t think I will continue to cut as much from each chapter, though. I know that the first few chapters were especially bloated. Plus, when I’m through this first round of revisions I plan on adding one or two scenes to the story, so the word count should end up right where I’d like it to be. So far, though I’d like to pick up the pace of my editing, I feel like my work is vastly improving from the first draft to the second. I’m very happy with the results. If I could only pick up the pace to a chapter a day, I’d be done in a little over a month, and then I’d be really, really happy. Now it’s time for me to start on Chapter 7. I’ll try to blog about the steps in my revision process and my plans for afterwards in a post next week. 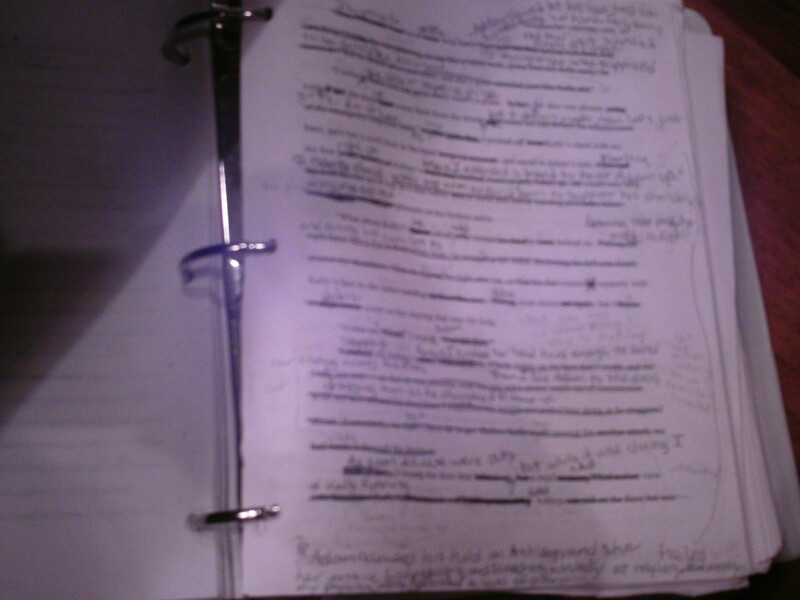 Maybe I’ll include a picture of my revisions on paper, so you can see just how many changes I’ve been making.